Everyone’s talking about the REST API right now and some pretty grand claims are being made, including an ambition for WordPress to become a component of 100% of the internet, not as a CMS but as an application platform. This is all very exciting for developers, but the vast majority of people working with WordPress are users and not developers. So if you’re a user, you’re probably wondering: Does the REST API have anything to offer you? But let’s start with a bit of history. WordPress was first developed in 2003 by Matt Mullenweg and Mike Little as a blogging platform; no more, no less. Blogging was becoming hugely popular, with the potential not only to democratize publishing but also to give a lot of people a new way to earn a living. Over the years, usage grew, and people started to use WordPress for purposes other than blogging, beginning a trend that has led to business sites being the most popular kind of WordPress site today. But the limitations of WordPress, originally designed for blogging, constrained what non-bloggers could do with the platform. This led to the introduction of features that transformed WordPress from a blogging platform to a CMS in 2010 with the release of version 3.0. This didn’t mean that everyone using WordPress for blogging just stopped. Millions of blogs are still run on WordPress, in particular on WordPress.com, which powers half of all WordPress sites including millions of blogs. 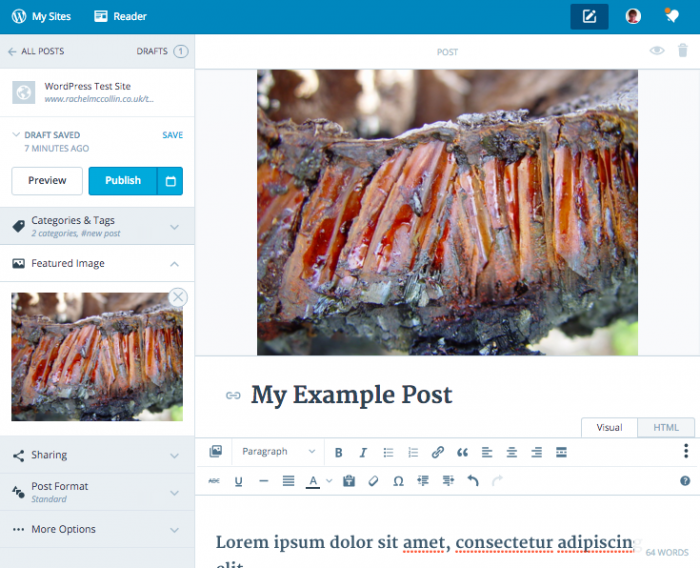 When WordPress grew to become a CMS, it didn’t lose sight of its blogging roots. 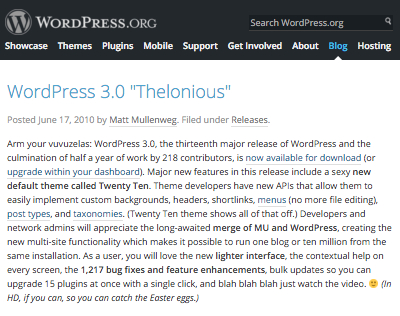 Plenty of blogging themes are still in the WordPress Theme Directory, WordPress.com remains the perfect place for bloggers, and services like Edublogs let people create their own blogs on platforms powered by WordPress. So WordPress has existed for the past six years as both a blogging platform and a CMS and has fulfilled both roles excellently. That’s encouraging, leading us to expect that it can also cope with being an application platform without losing sight of blogging and content management, and the needs of all users. What Could the REST API Offer? WordPress.com’s Calypso desktop app has shown us what can be done when the WordPress admin screens are redesigned, and while it does have its drawbacks, I think that it greatly improves the user interface for creating and editing content, which is what the average user spends most of their time doing. But there is a hitch right now – in order to use Calypso you have to have the Jetpack plugin installed and create a WordPress.com account. Not everyone wants to do that, particularly if you’re creating sites you plan to hand over to clients. But if you’re already a WordPress.com user, then Calypso should make the experience of managing your site easier and more enjoyable. My hope is that a future version of Calypso emerges that isn’t dependent on Jetpack, something made all the more likely by the fact that the REST APIs for WordPress.com and self-hosted WordPress sites are set to merge. The potential for admin systems isn’t limited to Calypso. Other providers of WordPress sites (like Edublogs, maybe) could harness the REST API to create their own bespoke admin system that can be run in the browser and on a desktop or mobile. Hosting providers could develop their own WordPress admin systems, bundling these with WordPress hosting and offering a service that sits somewhere between a self-hosted site and WordPress.com, with you hosting your own site on server space you pay for, with the option to manage it via your hosting provider’s dashboard. There’s a lot of scope here – it isn’t just about brochureware sites, but you can imagine developers creating app-like themes which users can install on their site and populate with their own content. Imagine being able to use a WordPress theme to create your own calendar system, spreadsheet program, invoicing system, or budget management app. What Do Users Need From WordPress? 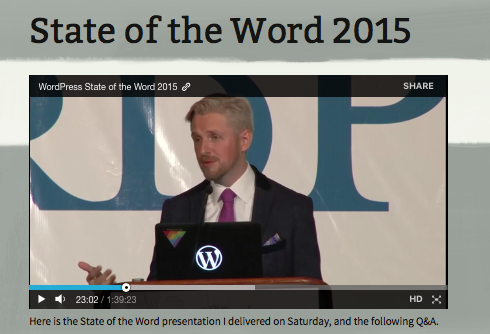 The average WordPress user isn’t a developer. I expect that many people reading this are happy to install WordPress, activate and customize a themes and plugins, and create a site with the addition of little or no custom code. WP-REST API or not, these two groups will still need WordPress to work well as a blogging platform or a CMS. They don’t really care about WordPress becoming an application platform and have no intention of creating apps (either web-based or not) that interact with WordPress using the WP-REST API. There are plenty of improvements in the pipeline that aren’t linked to the REST API. On WordPress trac right now, there are 278 active tickets, with just 13 of those relating to the REST API. That shows how much else there is that needs to be or is being improved. So we mustn’t lose sight of the fact that the REST API represents only one in 20 tickets that have been raised and isn’t the main focus. So whatever the REST API could offer users in the future, it’s crucial that we don’t lose sight of the (often unglamorous) things that WordPress already does excellently, and which millions of people use it for. There are days when I worry about what the REST API means for users, and there are days when I’m excited by it. On the positive side of the scales, we have the possible development of themes and plugins using the REST API that will let you use WordPress to create an application or to more easily manage your site through an improved admin system. On the negative side there’s the obsession with all things REST (try squeezing into a talk on the topic at any WordCamp right now), and the danger that in their eagerness to keep up, developers might forget about the vast number of users and clients who still need to use WordPress for blogging and content management. But overall, I think the outlook is encouraging. I’m sure there are developers out there already working on code that will revolutionize the way you use WordPress and the things you use it for. Exciting times! How do you think the WordPress REST API will make things better for users? Or do you think there’s been a lot of hype that doesn’t concern users? Tell us what you think in the comments below.